Bob Cook is a retired warrant officer from the British Army and volunteer curator of the Kohima Museum in York, which commemorates the Battle of Kohima and remembers the soldiers from both sides who took part. 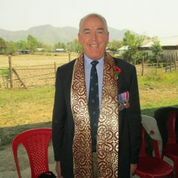 A trustee of Kohima Educational Trust and a member of the Burma Campaign Society, Bob is actively involved in activities to promote peace and reconciliation. He was part of a historic reunion between Japanese and British veterans that took place in Japan last year.